Creativity in Montessori - How Does Montessori Education Cultivate Creativity? How Does Montessori Education Cultivate Creativity? Families that are new to Montessori often ask: “How does Montessori encourage creativity?” This question often arises as the Montessori method is not overtly known for encouraging creative pursuits. In fact, Montessori is renowned for discouraging fiction and fairy tales. This may seem unusual in the context of children’s education; however, there is strong science behind focusing children’s education on the real. Montessori herself studied the way that children learn over more than 50 years. 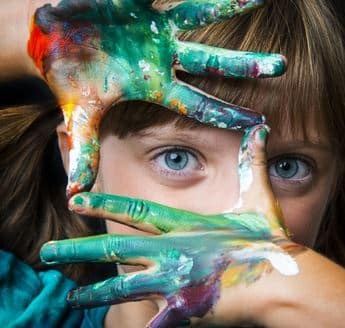 So, what is the Montessori view on creativity? In Montessori, we view creativity as a natural ability that is established through the process of child development. This process begins when the child is born, and progresses as the child develops their intelligence, sense of self and personality. Montessori believed that children possess tremendous creativity; however, to harness it, they must first learn to master their environment. It this way, Montessori views creativity as a skill that stems from a knowledge of the real. The Montessori method supports the development of creativity in numerous ways. One such way, is the prepared classroom environment. The Montessori classroom is beautiful, harmonious, and ordered. It cultivates creativity by providing students with a visually appealing learning space. The concepts of classroom community, freedom of choice, and movement are paramount. Through experiences in the prepared environment, children come to develop their independence, concentration, and sense of curiosity. These experiences allow the child to develop their sense of self and gain a deeper understanding of their world. By providing students with an environment that allows them to understand how things work, Montessori lays the foundations for the cognitive processes necessary for creative endeavours. The Montessori materials are sensory-based learning tools that are designed to teach children abstract concepts through hands-on experience. Most unique, is that each material is designed with a visual control of error. This means that the child can easily see and correct their own mistakes. By allowing children to control their errors, the Montessori materials teach them how to problem solve through repetition and practice. They also teach children how to accurately perceive the details and qualities of different things. By modelling real world problems in a concrete way, the Montessori materials teach children the skills of astute observation and critical analysis. These skills are strongly associated with divergent thinking and creativity. In Montessori, there is no set curriculum for art. Instead, art is incorporated into learning activities focused on a material or subject. Through artistic explorations, such as painting and construction, children come to understand how things look and work in the real world. Art activities also teach children how to develop the skills of hand and eye coordination. These skills enable children to apply their creativity, and master the materials and activities within their learning environment. In effect, the role of art in the Montessori curriculum is to develop creativity through practical application, and knowledge of the real. In summary, the Montessori method develops creativity by providing children with a sensory education of how the world really works. This knowledge lays the foundations for creative functions such as artistic expression, problem solving, and creative solutions. After all, how can an architect design a building, if they have no knowledge of geometric solids? Want to learn more about Montessori? Visit our blog!